Karate College 2017 Recap | Robert Mitchell Jr.
← Updates: Travel, 501(c)3 Status, WOOTW, etc. It would take 50,000 words to give a thorough rundown of this 3-day event, which really wouldn’t be practical without pictures — pictures I did’t take very many of because I wanted to stay focused and in the moment. But here are the highlights. But first, let start by saying that Karate College is the #1 adult martial arts summer camp in the nation. A couple of dozen of the best instructors in the world teach for 2 1/2 days in the beautiful Radford Recreation Center. The camp costs just $219.00, and affordable, spartan lodging in the Radford University dorms is available for an additional $36/night, making Karate College a real steal. I stayed in Norwood Hall. Here are some shots. Don’t forget to bring a blanket, your toiletries, and an extra towel. You get issued one towel, one washcloth, and no toiletries are provided. But he, it’s clean and cool. What do you expect for less than half the price of the Super 8 down the street? 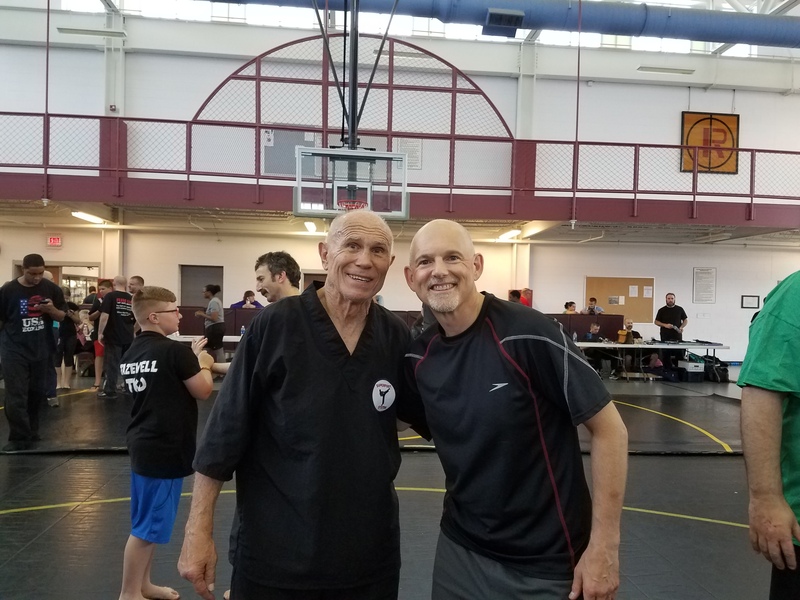 I spent 2 hours with the still-amazing-at-age-72 Bill Wallace learning Kickboxing. Bill, you’re a goofball and real hoot. Yours truly with the incredible Bill Wallace. I’m the goofball on the right. He’s the goofball on the left. Another hour with John Miller doing Combat Sambo. Excellent stuff. If you see him, ask him about “beach pose 1” and “beach pose 2.” John is a likable, funny guy with a nice big Buddha belly. My impression is that you do not want to mess with this Yogi’s picnic basket. In fact, you should probably not comment on his belly. I was too busy sweating to take pictures. What does that tell you? The guy below is Josh Bishop. He has a black belt in TKD and has many years of experience other arts. Oh yeah, and I almost forgot: a BJJ brown belt under Renzo Gracie affiliate Team Mannon in Roanoke. He broke apart the scarf hold for an hour, showing two solid defenses that I aim to try out next time we grapple at the club. Josh is what I like to call ‘the real deal.’ Check out the wicked gi his girlfriend bought for him. 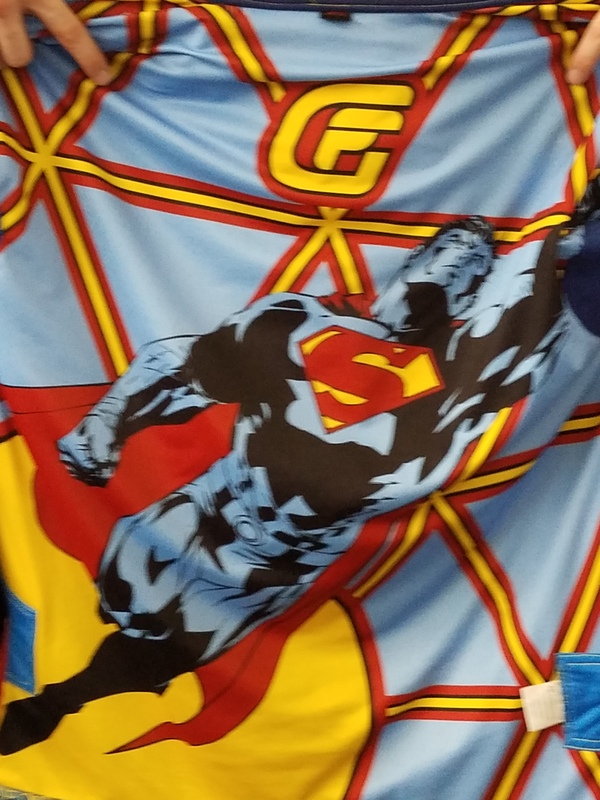 He’s not actually Superman, just close. 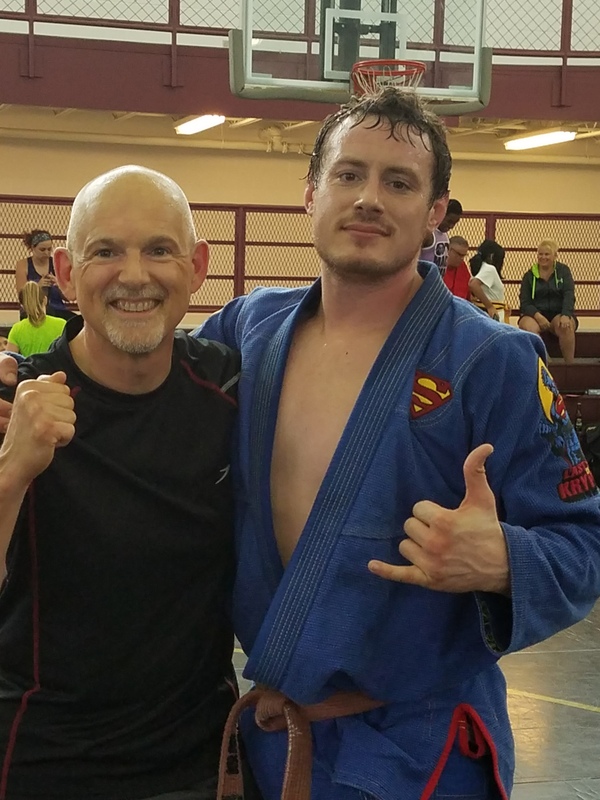 Me and Josh Bishop, a brown belt under Renzo Gracie affiliate Team Mannon in Roanoke. 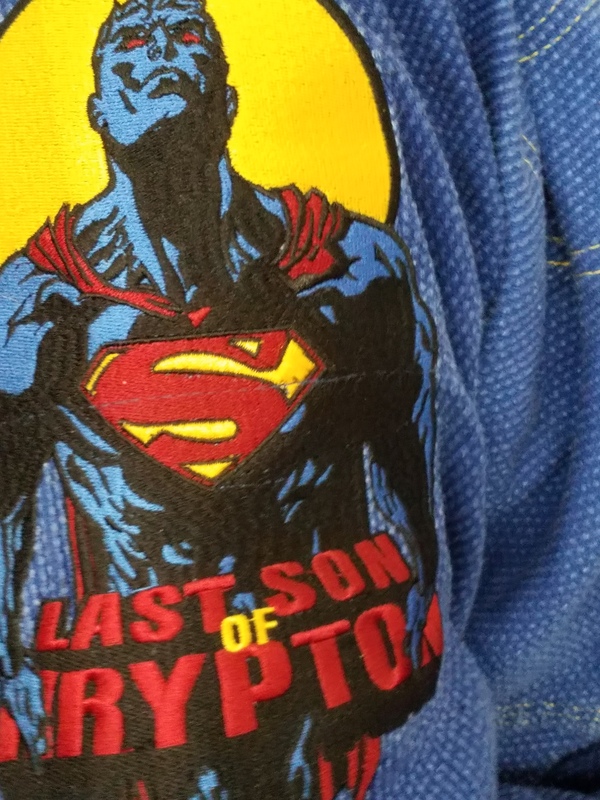 Right upper sleeve of Josh’s gi. There were 21 instructors at Karate College. I only worked out with about 15 of them, and I’m only blogging the ones who really impressed me. 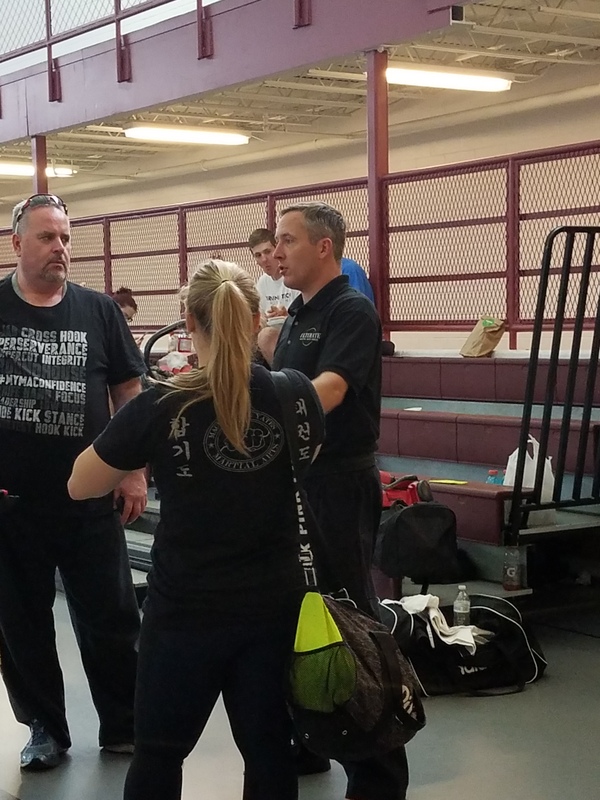 The next one who did that was Hapkido Grand Master Scott Yates. 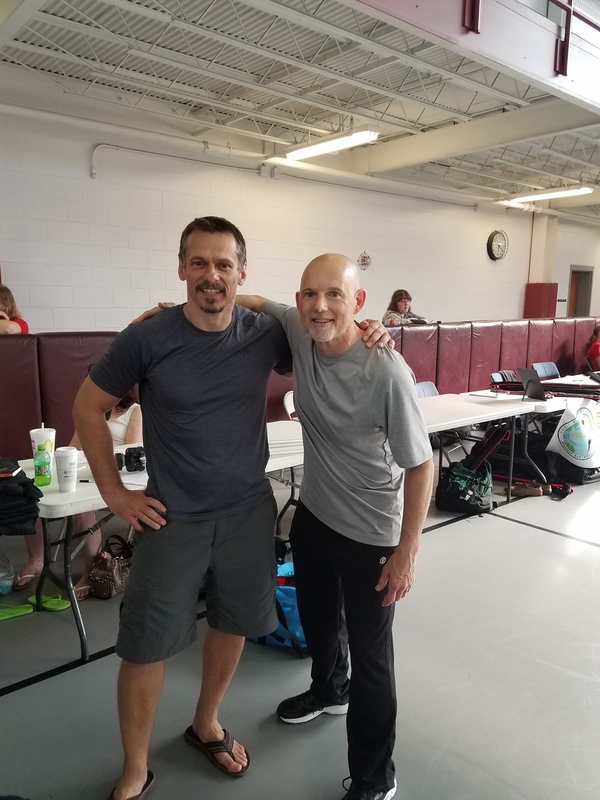 Hapkido Grand Master Scott Yates. He’s the one smack dab in the middle of the picture. I’m not easily impressed by Aikido/Hapkido-related practitioners and styles because they often involve lower contact, reduced intensity, and preconceived notions that inhibit realism. GM Yates started the seminar by having a BJJ blue belt put him in a full force clinch from which he escaped with relative ease. He and his guys are different because they train with heavier sincerity and contact. They pull off fancy wristlocks because they don’t train with compliant partners and they’re willing to modify and explore techiques. He taught me a Z-lock that I think a 98-pound weakling could use against a linebacker. I saved the best for last. I spent four hours with gentleman and scholar Mark Hatmaker, “the coach,” a.k.a “the walking encyclopedia of wrestling holds,” or as I like to call him “The Computer Wore Wrestling Shoes.” When Hatmaker puts hands on you, even though it’s gently just to illustrate, or if you hold some pads for him to strike, it’s not the same as what you’re probably used to. Train with him. You’ll be glad you did. Two of those four hours were spent in the first unveiling of Mark’s Frontier Martial Arts material. That seminar included thumping, caulking (“corking”), cupping and a nice little re-work of the classic Duck-under with a nasty finish. Did you know that Mark taught himself the Comanche language so that he could interact with the folks who have the information he needs for the program? Anyway, here are the photos of me and Mark and the certificate I earned from him. I think we’ll close with that. 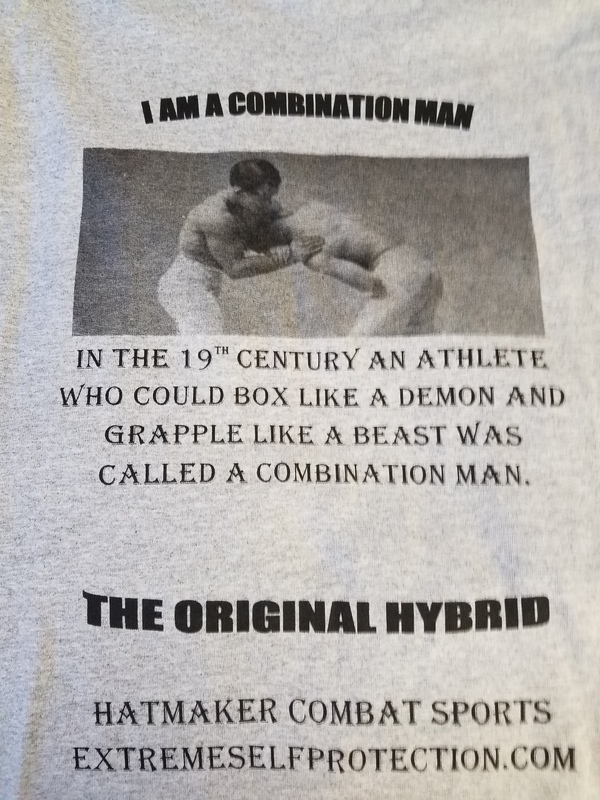 The back of the t-shirt I got from Hatmaker. Now all I have to do is fill the shirt up with something. 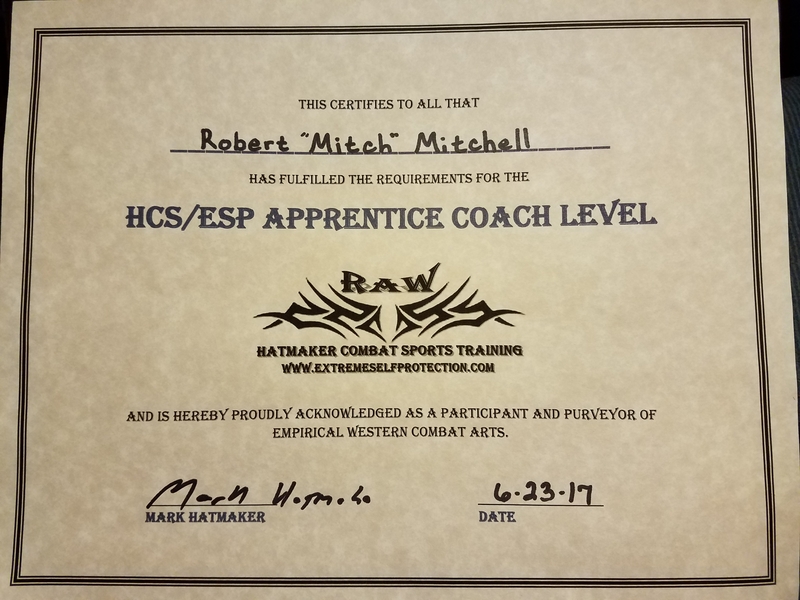 The apprentice Coach Certificate I earned from Mark Hatmaker. This entry was posted in Martial arts, Writing and tagged karate college. Bookmark the permalink.